From the suburbs of Chicago to the rural reaches of Illinois, we’re highlighting some of the state’s great summer art festivals. These offers a unique collection of works from local and national artists and artisans, plus musical entertainment and food as well. And for those traveling to fests down in south-central Illinois, we’ve provided a suggestion for lodging too! The works of 128 of the region’s most talented artists and artisans will be on display at this two-day fest held on the streets of uptown Normal. Look for sculpture, jewelry, wood creations, fiber arts, photography, paints, and more. This charming north shore town is a lovely setting for the two-day fest featuring more than 110 juried artists from across the country. Visitors will be able to visit with artists and view works that include paintings, ceramics, glass, jewelry, photography, and other creations. There will also be artists’ demonstrations, as well as scavenger hunts for kids. More than 60 juried artists will be at this year’s festival, which has a little bit of something for everyone. The two-day event includes live music, children’s activities, live artist demonstrations, caricature artists, food, wine, and craft beers. 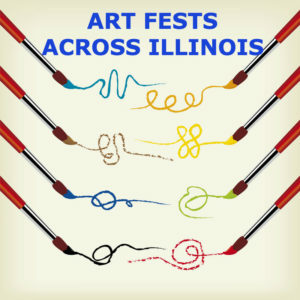 This fest features artists from around the country, a Children’s Corner with make-and-take projects, and an interactive community mural where everyone is encouraged to participate. More fun comes with live music concerts, dance performances, and food and drinks. When you’re visiting the arts festivals in Peoria and Washington, check out—and check into!—the Mission Oak Inn. It has a picturesque country setting and suites that pamper guests with two-person whirlpool tubs, two-sided fireplaces, custom-built mission style furniture, and a delicious gourmet breakfast each morning. Mission Oak Inn is a member of the Illinois Bed and Breakfast Association … a unique lodging experience! This entry was posted in Art and Music, Festival, Illinois Bed and Breakfasts and tagged Festivals and events, Illinois Bed & Breakfasts, Summer activities by admin. Bookmark the permalink.